If I hear what a couple of my interlocutors are saying, we need both a place to stand and direction of focus in order to tackle the massa confusa that rises up like a great cloud of unknowing every time we inquire into any topic of significance that is covered by Peirce’s writings. 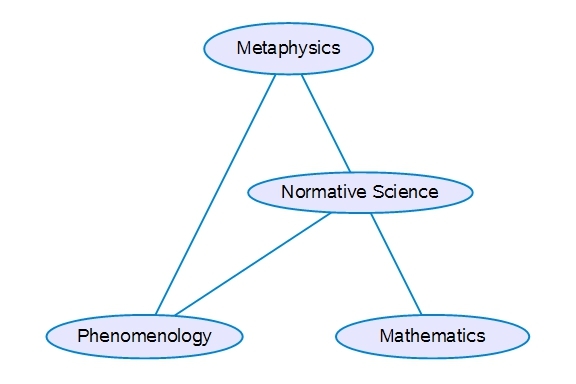 Peirce’s formula says a large number of very important things about the relationship among logic (a normative science), mathematics, metaphysics, and phenomenology. For one thing, he recognizes the classical distinction between descriptive sciences and normative sciences, which have independent objectives even when they survey the same domains of data. For another, he allows for the collaborative or complementary duties of phenomenology, the observation of what appears in experience, and mathematics, the exploration of possible forms of existence. In scientific varieties of inquiry, phenomenology and mathematics operate in tandem, the one supplying a stream of observational data and the other fitting its evolving stock of models and theories to the flux in hopes of finding or making one that makes partial sense of it all. That will serve as a place and a stance to start. Next to mark a few points of direction and focus. This entry was posted in C.S. Peirce, Definition, Determination, Inquiry, Logic, Mathematics, Metaphysics, Peirce, Phenomenology, Semiotics and tagged C.S. Peirce, Definition, Determination, Inquiry, Logic, Mathematics, Metaphysics, Peirce, Phenomenology, Semiotics. Bookmark the permalink.